Through intelligent features, the CMA valve is said to provide a whole new level of efficiency, productivity and predictive maintenance solutions. 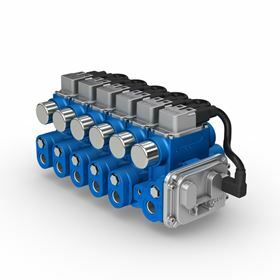 The CAN-enabled electrohydraulic mobile valve features on-board electronics and software algorithms, which is said to offer a valuable solution in the industry standards for intelligence, capabilities, dynamics and control. Eaton says the CMA valve, available with rated flow of 90 or 200 liters per minute (LPM), improves machine performance without the need to compromise. Independent metering on the valve allows each spool to control its own work port for consistent speed and better control on services which transition between passive and over-running states. Real-time diagnostics and hose burst detection are made possible through the use of twin spool architecture, on-board sensors and data processing that provide pressure information to the user interface and implements proprietary Eaton control strategies to optimize performance. Additionally, the new valve’s software-driven setup is said to reduce design and build costs and speeds time to market. Combined with Eaton’s Pro-FXTM family of electronic controls and software, the valve easily integrates with controls and allows performance optimizations to be made and tested in seconds instead of months. Pre-built software libraries and industry-standard protocols such as J1939 and CANopen also reduce development time. Eaton’s CLS sectional mobile valves offer modularity and versatility in the mobile equipment market.